Down Syndrome Association for Families of Nebraska (DSAF) - KEARNEY, NE - Individual Education Programs (IEPs) and Medical Concerns Specific to Children with Down syndrome. KEARNEY, NE - Individual Education Programs (IEPs) and Medical Concerns Specific to Children with Down syndrome. Individual Education Programs (IEPs) and Medical Concerns Specific to Children with Down syndrome in Kearney. DSAF will be in Kearney on Saturday, June 13, presenting on the subjects of I.E.P.s and medical concerns specific to parents of children with Down syndrome. We hope that you can join us for this opportunity to interact, network and ask questions. We encourage you to pass along this information to anyone who could benefit from this workshop. The attached "poster" can be printed for further promotion, as well. 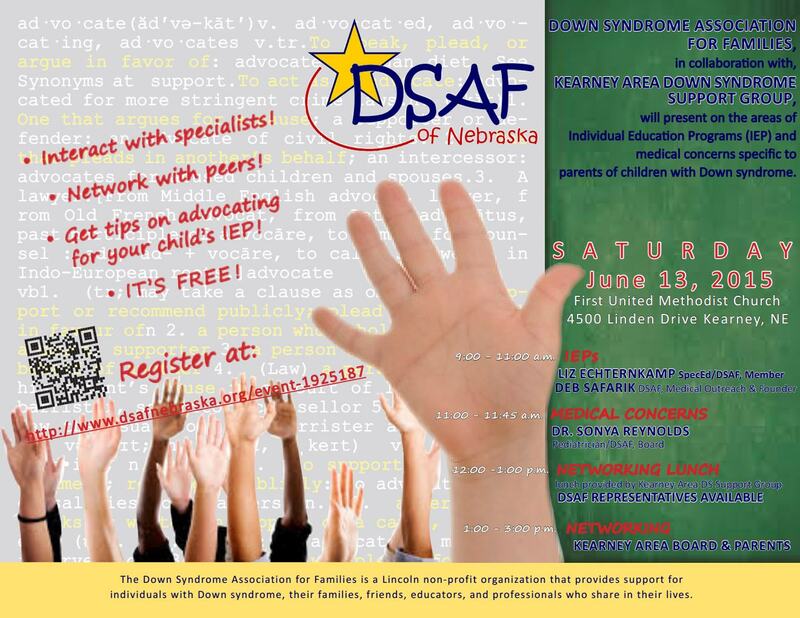 Please see attached flyer "DSAF in Kearney" for more information or visit: http://www.dsafnebraska.org/event-1925187 to register. P.S. It's FREE - and lunch will be provided to those who pre-register, compliments of the Kearney Area Down Syndrome Support Group!